ekiBlog.com: New Year! Giveaway Winner Announced! New Year! Giveaway Winner Announced! Thank you so much for all the support with the New Year Giveaway! 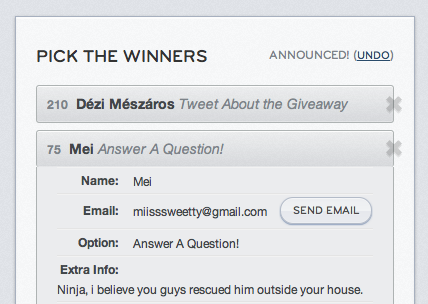 With 3600 entries in I cannot tell you how thankful I am to you for entering this giveaway and for the kind support. 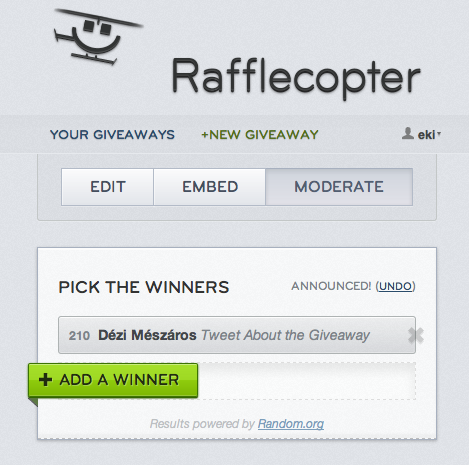 After double checking the entries for qualifying entries Rafflecopter has randomly chosen the winner! I have emailed you with infos please respond back! What made me really happy was that the +1 "what is my pet cat's name? and how did I end up with him? =^_^=" was a additional bonus question for those who has been following my blog for a while and what surprised me that most of you knew the answer to this question! THANK YOU! Thank you all for stopping by! will be having another giveaway very soon for ekiblog.com's 3 year blog anniversary! That sounds like how we got my grandmother's kitty. We used to feed his momma who was a stray, we didn't know she was pregs and suddenly we heard tons of mewing outside one day.. Brave little guy just RAN into our apartment one day and my grandmother decided she was gonna keep him. I'm glad we saved him because sadly the others were caught by animal control! I really wanted all the kitties and the momma cause she was so cute. Your cat is so cute! Congrats to the winners! Wow, that kitten is so good! !